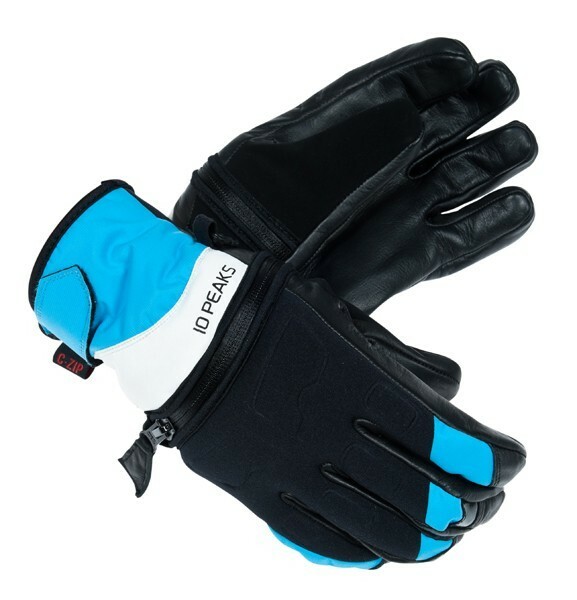 An ideal glove for the recreational skier, offering convenience you've never had before. I’ve had a pair of C-Zip gloves from 10peaks for the last couple of months, and have been trying them out both at my local snozone as well as on my recent trips to Glencoe and to Nendaz. The glove I have is at the lower end of the range, but I’m not testing that specific model as such, but more the unique C-zip concept that sets the entire range apart. The C-zip is, as you may have guessed, a zip. It runs around the back of the hand allowing the glove to be opened, and your fingers and thumb exposed enabling you to do all sorts of fiddly things which you would normally have removed your gloves for. In practice, the concept works very well, far better than I was expecting actually. I have wrist straps on my own gloves and they are certainly a help, but you still have to take your glove off and on and sort out the cuff and velcro straps and whatnot, and with them dangling they do get caught on things or make getting your pack on and off a little tricky sometimes. The C-zip is so easy to use in comparison. The zip can be easily opened and closed with a gloved hand, once open you can remove and insert your hand from the glove one-handed, and you never disturb the cuff area. I found myself able to do things like checking my phone on the poma, and not have to worry about getting my glove back on in time at the top. Stash the phone in my pocket, slip my fingers back into the glove, dismount and do the zip up at the top. The opening back also has benefits for ventilation when its hot, perhaps a late season ski trip, but also to aid drying. After a soggy day on a rainy hill, they were easily dry overnight, something I’ve only really encountered with gloves which have removable liners in the past. There are some potential downsides, however. Even with the zip fully closed, there’s still a very small opening where the zip ends. While I wasn’t aware of any water ingress, even while skiing in Glencoe rain, I did notice that if I opened and closed my hand it could act like a little air pump and I was able to feel a small draught of air through the opening. I was also aware that I could feel a part of the zip-pull on my skin at some times. Neither of these issues would be a cause for concern generally, but wondered if they might be more noticeable in conditions of extreme cold. With that in mind, I took them along withe me to Nendaz last weekend. We saw temperatures of -20 on some days, and were skiing in both windy and snowy conditions. My fears were unfounded, my hands remained warm and only started to feel chilly after standing about for almost an hour while waiting for a bus (so unlike Swiss public transport), but to be fair, everyone was feeling the cold by that point. In the sun and when it was a little milder, it was quite pleasant to be able to unzip the back and let some air in. After the second day of using these gloves, my own gloves just stayed in my pack for the rest of the trip. As I had my cameras with me and was stopping frequently to take photos and also starting and stopping my helmet cam, being able to pop your hand out to do it quickly and easily became second nature. Everyone that saw them in use were asking about them, and when demonstrating the concept in gondolas and on chairlifts, I could probably have sold the gloves ten times over. Glove is easy to zip open and closed. Much faster than removing gloves. When opened, it doesn’t get in the way or seem to catch on anything, so operation of zips, cameras, phones and whatnot are quite easy. I genuinely can’t think of any! Only time will tell on build quality, but they are holding up fine so far. The only possible concern for some could be that the back of the hand may not be as well insulated and there is that air-pump sensation. However, in practice, I certainly wasn’t aware of either of those so I say it’s something to be aware of but certainly not to the extent that it would prevent me investing in a pair. 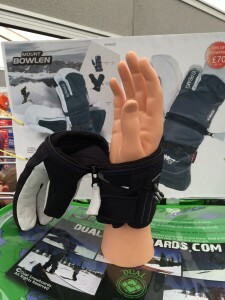 This concept makes for an ideal glove for the recreational skier who might want to stop and take photos, rummage in a bag on a chairlift and pass around snacks or, lets be honest, have a smoke or make some yellow snow. I can see it’s especially suited to parents of kids where faffing with zips, boots, hats, lipbalm and what not are a frequent occurrence.